Back in June, we saw a tour of the Food Depot supermarket in Newark. The store operates with a sister store in Kearny. 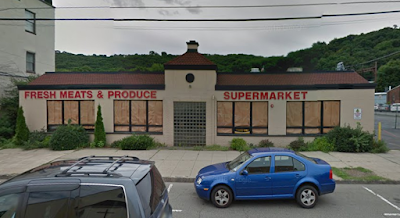 Unfortunately, the success of Food Depot doesn't seem to have made it out of the Newark/Kearny area. Dover previously had two Bravo Supermarkets, one here and one at 36-42 W Blackwell St. The West Blackwell location remains in operation, but this one at 120 E Blackwell St didn't make it. Up until somewhere around 2010, this store was operating as a store called Pre-Unic Supermarket (I have no idea what that name means). By 2016, the store was fitted with a new Fresh Meats & Produce Supermarket sign, along with Food Depot signs for parking on the right side of the building. My 2017 visit shows that the building has remained vacant but has been painted. I wonder if another tenant is planning on moving in. Closeup of the Food Depot sign. The new color scheme looks pretty sharp. The entrance faces the parking lot, as seen here. Any updates? At the time of writing, the building was still vacant.